Here are Mother's Day flower & garden crafts projects for kids to make as gifts for Mom on Mother's Day. The following arts and crafts activities are for making handmade flowers, flower pots, garden plants, etc for Mom as presents or gifts. Oh my, your Mom will love this one. It is so easy to make too. Find a picture of yourself that you are allowed to use in a craft (such as a school picture). Find a cup or other circular item that will fit around the face in the photo. Then use the cup to trace around your face. Cut your face out now. Then you want to find a cup or circular item that is slightly smaller than the first circle. With that item, trace a circle out in decorative paper, card stock, or construction paper. Then either cut out petals shapes around the circle. If you want, you could just cut a circle around the first circle and then glue petals around the outside...it is up to you. 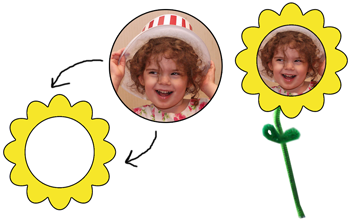 Then glue your photo circle (that you cut out earlier) under the flower circle. Then tape a green pipe cleaner on the back of the photo. If you want, you can make petals by looping a pipe cleaner around the stem 2 times. Your Mom will love this thoughtful present. If you think your Mom is special, then how about making her a very special homemade present for her on Mother's Day. This flower pops up out of its flower pot and looks really cool. Find a paper plate and color it green. Now get a decorative piece of paper or at least a colored piece of paper.Make it about 2 inches high (about 1/2 inches of it will be folded). Cut a tab on one end and a slit on the other end. Now fold 1/2 inch at the bottom. Wrap it around the plate and glue it to the plate, closed. Now get a colorful piece of paper and cut it in a spiral, except for the very inside of the circle .... This will be the flower. You can use other colors for the inside of the flower...as well as glitter, and other decorative touches. Now glue the bottom of the spiral to the bottom plate. Decorate the flower pot to say something nice for your favorite Mom. This would also be great for an Easter table decoration. This is a great present for toddlers, preschoolers, and Kindergarteners to make for Mom. Just get some children-friendly paint - such as tempera. Put newspaper down first to protect your tables and then put down a white piece of paper for the actual picture. Put red paint and green paint in separate pie tins or on a paper plate. Then dip the child's hand in the red paint, shaking off excess paint, carefully. 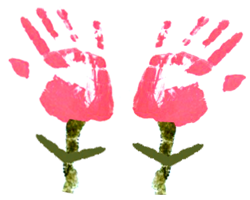 Put the child's handprint down ... one for each flower. Then have the child dip his finger in the green paint and draw a line down for the stem of the flower. Then dip the child's finger in the paint again and put a fingerprint for each stem. Sit the paper out to dry before giving to Mom. This is a great craft for school children to make a Mother's Day gift for Mom. Firstly, protect your table tops by placing newspapers down upon the table. Then place a piece of paper down for the child. Place a few drops of thin, brown paint upon the paper. Then give the child a drinking straw (non-bendy type). Ask the child to blow air at the paint. This will create a cool effect, similar to an air brushpainting. After the child is done, he will see the paint has gone in many different directions, similar to branches on a tree. Let the painting dry. Place flowers all over the tree with tissue paper. All you have to do is cut out some tissue paper squares in flower-like colors, such as red, yellow, orange, purple, etc. Then just crush those squares into the paper...upon the tree with glue. You now have a beautiful flower tree present to give to your Mom. This looks beautiful when it is complete. Just get an egg carton....and cut the top off and just use the bottom. In each hole, place a dot of glue and then put in there brown play dough or clay to represent dirt. Then take a popsicle stick for each flower stem...you can color it green with markers or paint. Cut out the tops of the flowers from red paper. 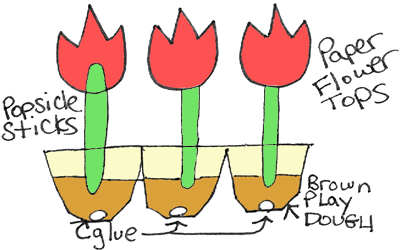 If you don't know how to draw a tulip, then just draw an egg shape with a letter 'W' at the top of it. I hope your Mom loves this gift. This beautiful box filled with homemade candy or cookies that you made yourself would make a wonderful gift for any occasion, especially for Mom on Mother's Day. Remove the cover from a Rolled Oats, Oatmeal Box. Cut a piece of fancy paper to fit around the box, and glue it in place. Cut a piece of the same paper to fit the cover and glue it securely. Ask Dad (or an older sibling) to help punch four or five holes in the cover with a screw driver or nail. Cut pieces of colored drinking straws in different lengths and place them in the holes in the cover. Cut out flower faces from colored paper and decorate with colored wax crayons. 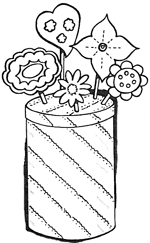 Glue a flower face to each straw, then fill the box with candy or cookies. Fold one tissue in half in the opposite direction to the regular fold lines. From one end of folded tissue to the other, make a series of accordion folds about 1/2 inch wide. Press these pleats (folds) together. Over the center place a bobbie pin (hair pin) or a piece of 24 guage wire that has been bent in the shape of a hair pin (if wire is used). Twist ends together. With your fingers, tear 3/4 " from each end and spread the ends. Separate the top layer of the tissue and bring it up in the center. Separate the 2nd layer and bring it up towards the center but not as far as the 1st layer. Spread out a thin layer of dry tempera powder in order to tin edges of the tissue. Bobbie pin or wire stem can be taped with florist or masking tape. When taping, a pin-back or safety pin can be secured to the stem in order to secure carnation flower to clothing. Your Mom won't be able to resist these beautiful flowers. Just collect items from around your house and then get your scissors out and cut yoru 3 ounce cups up the way that is displayed in the illustrations above. Just glue the cups together, poke a hole and straw through the center hole. Fold the flower pedals backwards and then give it a cetner of tissue paper, cotton, or tissues. Get some gift wrap or decorative paper out and fold it around the flowers and tie it up nicely in a bow. Give this beautiful gift of flowers to your Mom and watch her eyes well up with tears of joy. Flowers for Mom: Easy to make Paper Flowers with only 4 Materials - It is simply to make some pretty flowers with paper. Kids love this and what is even better is that they are so easy to make, a child of almost any age can make. You can also do a multitude of things such as mounting them on a Popsicle stick or use them to decorate pictures or cards. What is even better is the fact that these little flowers can be made with only a few items that can be found around the house. Making Twig Tissue Paper Flowers for Mom - These flowers in a yogurt container flower pot make a beautiful Mother's Day present for your Mom. Pendant Booklet That Opens Up Into a Daisy - Your Mom or Grandma will love this thoughtful necklace that holds a book that transforms into a flower. How pretty. How to Make Flower Vases With Recycled Plastic Bottles - This is a recycling and a Mother’s Day Present Arts and Crafts Activity for Kids to Make. Recycling can be your way of taking care of the environment. Here’s a great craft activity that makes it really fun to recycle. Make a flower vase out of an old plastic bottle and then put fresh flowers in it for Your Mom. 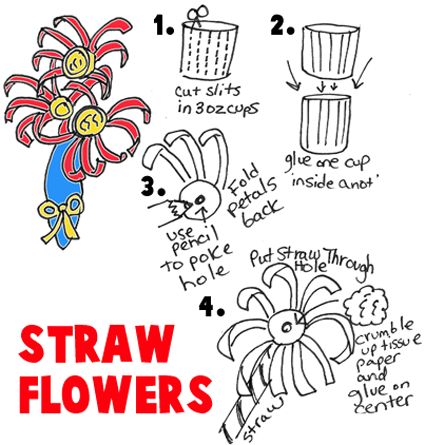 Make Flowers from Drinking Straws - Find out how ot make these adorable flowers with these simple instructions. Making Paper Roses - Learn how to make this paper rose with these paper sculpture techniques. How to Make a Long Stemmed Flower - Make this daisy for your mom, grandma, or someone else special. Make Tissue Paper Flowers - These are really nice to look at and easy and inexpensive to make. Your Mom will be astonished that you made them all by yourself. 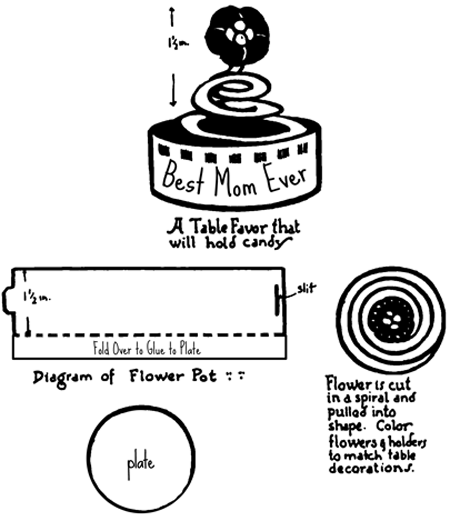 Foldable Flower Stand Craft for Mom - This is a great and easy craft to make a flower stand for your Mom...all you have to do after you make it is to buy or pick a beautiful flower to put in the stand. Make Your Mom a Dried Flowers Picture - These pressed & dried wild flowers turn out gorgeous when matted with construction paper and plastic wrap. Find out how to make it by following the tutorial. How to Make Lilies / Bouquet of Flowers Craft With Your Kids Handprints - This is a very cute Easter lily flower bouquet craft for young children and preschoolers … even older children will enjoy it. With just a few craft materials that are probably already around your house, you will be able to make cute Easter Lilies with your child’s own handprints. Tissue Paper Flower Bracelets - Find out how to make these beautiful tissue paper flower bracelets with tissue paper and pipe cleaners. How to Make a Table Decoration Vase Craft Gift for Mom - I know that you love your Mom. Do you want to make a thoughtful gift for her? This is a small easy- to-make present that Mom will love to show off to her guests. You can change the color of the ribbons and decorations to make them match with your Mom’s tableware. Making Hearts Flowers - Learn how to make this paper-cut project that is a flower made with heart petals. Foil Doily Flowers - Learn how to make these fancy flowers to give to someone you love...like Mom or Grandma. Wooly Fuzzy Yarn Flowers - Make these soft, wooly flowers with some yarn and cardboard. They turn out so soft that you will swear there are sheep in these things.